By GreenEyedLillies on March 13th, 2009 . Filed under: Bed, Bath, Body, Contests, Jewelry, Stationary . This cupcake giveaway started March 9th and runs through April 4th with 3 winners announced April 5th via the use of Random.org. Prizes are a blend of jewelry from Etsy shop, RockerJewlz & paper craft shop, MomsArt. 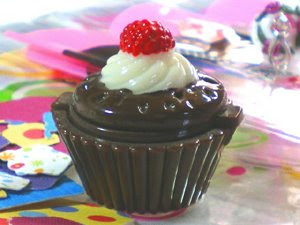 22 points possible to win fun cupcake goodies so be sure to check them ALL out. Giveaway is open worldwide to everyone who leaves their email in some form, either typed in a comment or automatically noted via your entry venue (Blogger, etc). Gotta have your email to tell you if you are a winner! 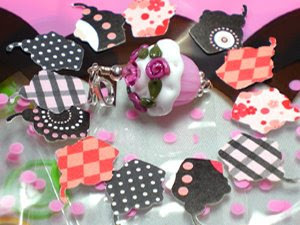 The grand prize package features a pink handcrafted lampwork glass cupcake pendant & my hand punched cupcake stickers in my most popular “Paris Chic” paper pattern. 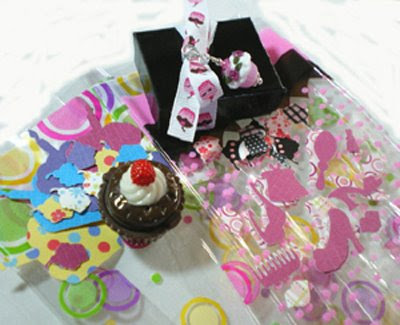 The second winning package features a cupcake pot of chocolate lip gloss and 2 sizes of my cupcake stickers in solids & patterns. And last but not least, the third prize is a fabulous set of my “Girly Girl” stickers in fun shapes like high heels, purse, comb, pair of sunglasses, mirror and lips in pink solids & patterned papers. 2 entry methods give you 1 point WHEN YOU LEAVE A COMMENT telling me you: a) Responded to my poll…b) Became a follower of this blog (RockerJewlz NOT All Things Cupcake)…1 point for emailing me with YOUR email HERE to receive my newsletters announcing future giveaways, sales, and special deals. Please use “NEWSLETTER” as the subject. Total possible points for the above: 42 methods earn you 5 BIG FAT POINTS:a) WHEN YOU EMAIL ME that you announced this giveaway on your own blog, including a hyperlink back to this giveaway. (Julie@RockerJewlz.com). b) WHEN YOU PURCHASE ANY ITEM(s) from either shop you receive a 20% DISCOUNT AND FREE WORLDWIDE SHIPPING! BE SURE to type the code GIVEAWAY in the “Note To Seller” portion before submitting the order so it counts! (Don’t pay yet: I will adjust your invoice at this point and reply to you with the discounted total). Total possible discount/ship savings: 30%!!! Total possible points: 10How to leave a comment: Click on “Comments” and it will take you to a box where you can leave a comment. If you do not have a blogger account, you may leave a comment using “Anonymous”, but make sure to leave your first and last name and then click “Publish Your Comment”. And finally, Have fun, and thank you for participating and good luck! 9 Responses to Cupcake Giveaway! I am following, great blog btw. Chocolate Aqua Cupcake Lampwork Earrings are so yummy!! Fabulous Pink Party Dress Button Set of 2 are really cute at MomsArt. If you are trying to enter the contest your comments need to be left at RockerJewlz NOT All Things Cupcake. I LOVE coming to this site, there is ALWAYS something interesting going on. If you liked this site you will probably like this site too: http://www.winfreegiftcardsonline.com . Its a nice website for earning gift cards online .